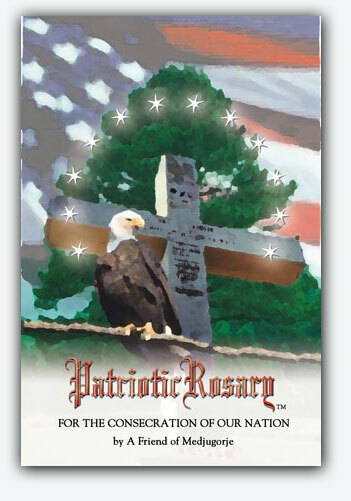 The Patriotic Rosary is prayed everywhere from within cloistered convents, to inside the Pentagon; from dangerous military ﬁelds around the globe to the quietness of the Bedroom of Apparitons and the Field of Apparitions at Caritas, which is the home of the Patriotic Rosary. The Patriotic Rosary quickly captured the hearts and attention of millions when ﬁrst heard and prayed. Inspired by Our Lady of Medjugorje, the Patriotic Rosary is a powerful prayer for divine protection and mercy for our Nation and its rebirth. The history of the writing of the Patriotic Rosary origins back to 1995 at Independence Hall in Philadelphia, where the ﬁrst promptings of Our Lady was felt and the impulse to form the Patriotic Rosary was given. The Patriotic Rosary, the Prayer to Heal Our Land, and the “Seven Novenas for the Reconciling of Ourselves, our Families and our Nation Back to God,” all for the rebirth of America, have the grounds at Caritas of Birmingham as their home. It is Caritas of Birmingham, whose founder, known as A Friend of Medjugorje, wrote the Patriotic Rosary, and that also operates the Official Medjugorje Site. It was a surprise in 1988, after many prayers near the Pine Tree for the healing of our Nation that Our Lady began to write a beautiful story, through Her Medjugorje apparitions at Caritas, telling us that a Nation and its healing, represented by the Pine in the Field, would come only through the individual, represented by the family bed. In those ﬁrst apparitions, Our Lady appeared in the Bedroom over the family bed, then on Thanksgiving Day, November 24, 1988, She appeared near the Pine, then back to the Bedroom for the remaining two months of daily apparitions. This spoke clearly that our Nation would be healed through strong marriages forming strong holy families raising strong individuals which will heal and make a strong nation. Our Nation’s future depends on the healing of the family. We encourage you to spread this special rosary, to all your family and friends, and to print it for free and pass out to everyone you know.